Most of the desktops and laptops today come with Windows 7 preinstalled. While it has new features, few users like me love to have Windows XP for some compatibility issues. 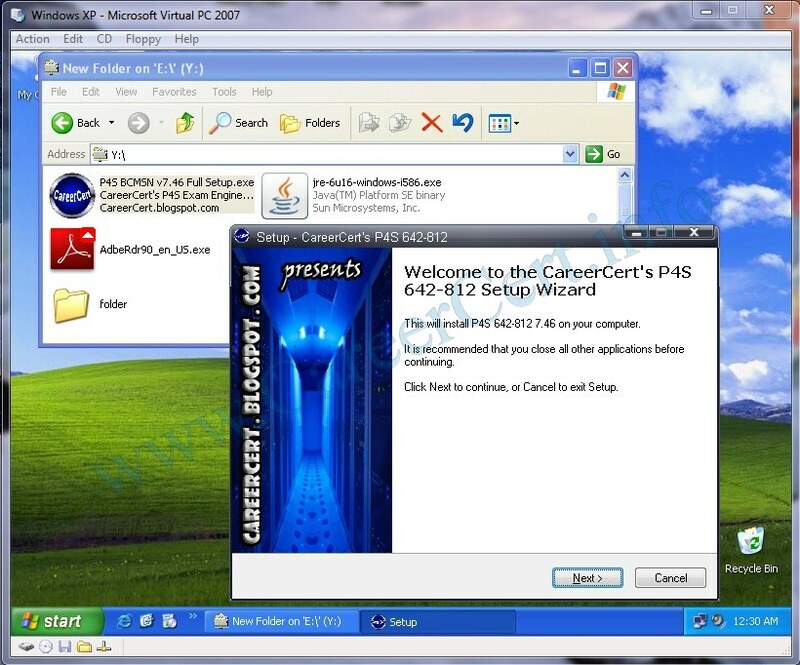 As you see that CareerCert’s Pass4sure setup doesn’t work in windows vista or 7. So we need to install XP in that. For those who don’t know, Microsoft Virtual PC let’s you run multiple operating systems at the same time on the same physical system. You can switch between two operating systems within seconds. In this tutorial i will show you how to install Windows XP inside Windows 7 using Microsoft Virtual PC. 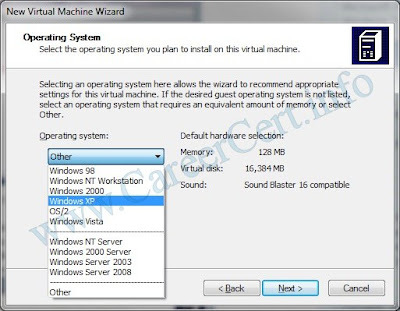 You can follow the same procedure if you want to install on any other version of windows like Vista or XP. 1. Windows XP CD or .ISO CD image. 2. Microsoft Virtual PC software. 3. One hour free time. 2. Run the Virtual PC software. 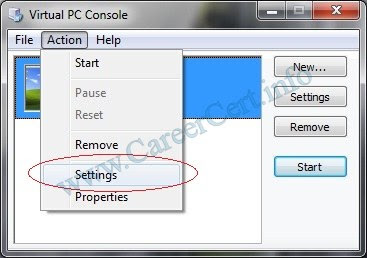 To do this, type Virtual PC in Vista Start menu search box and hit enter or start from desktop shortcut. 5. Here, type a name for the virtual machine file. The file is automatically saved to the My Virtual Machines folder. To save it to a different location, use the “Browse” button. 6. 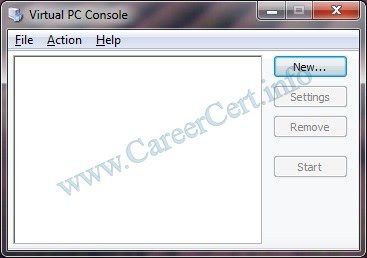 Select the operating system you would like to install using Virtual PC from the drop down box.In this tutorial we choose XP, as we are going to install none other than XP. After selecting the operating system, click “Next”. 7. If you have more than 1GB of RAM in your system, select “Adjusting the RAM” else select “Using the recommended RAM”. If you have chosen “Adjusting the RAM” then, select the amount of RAM you would like to allocate to run Virtual machine(XP) and click “Next”. (by default, it will use 128MB of RAM, if you like to keep as it is, blindly click “Next”). 8. 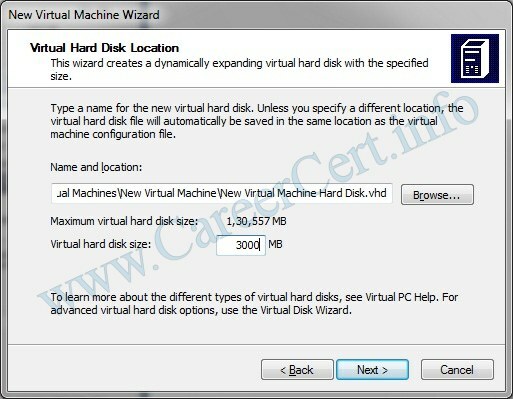 In the next screen, select “A new virtual hard disk” and once again click “Next” button. 9. In this step, browse the location where you want to create a virtual hard disk and specify a name for the virtual hard drive. Make sure that you have enough free space available in that drive. Also don’t forget to specify the size of the Virtual Hard Drive. I prefer at least 3GB. You can see in below image that there is no XP boot CD in the drive yet. You can also use a .iso CD image instead of a burned CD. For that go to CD menu and click on “Capture ISO image“. Browse for the image and click Open. After that send “ctrl+alt+del” from Action menu. I prefer this method because installation will be fast using a image. Hit Enter when Virtual PC console prompts to press a button to boot from CD. You will see default XP installing environment inside the console. 13. 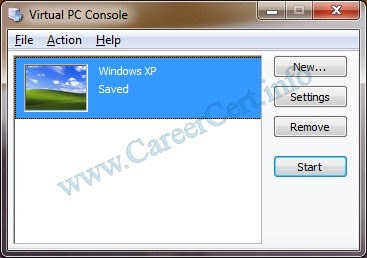 Install the XP inside the console with the default XP procedure that you know. Once you finished your installation you will see friendly Windows XP Desktop. 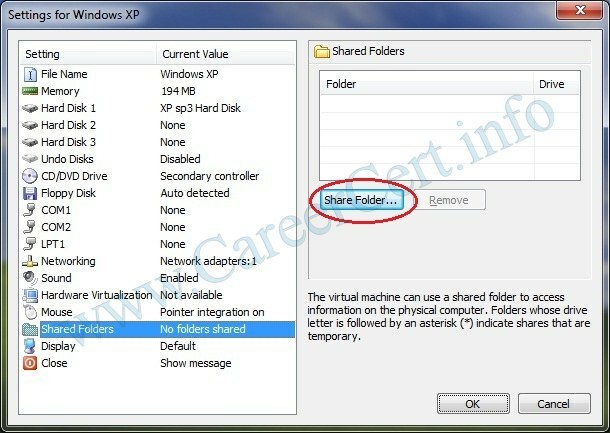 To access software setups files from our host machine(Vista or 7) we need to share a folder between Virtual XP and Host machine. 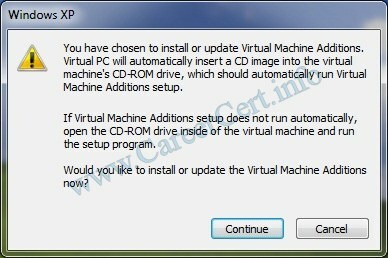 To do this first we need to install “Virtual Machine Additions” in XP. Go to Action menu and choose “Install or update virtual Machine Additions” and click ‘Continue’. Once setup finished, the XP console will restart. 15. Now go to Edit(or Action) menu – Settings – Share Folders. Choose a folder to share and select “share every time”. 16. 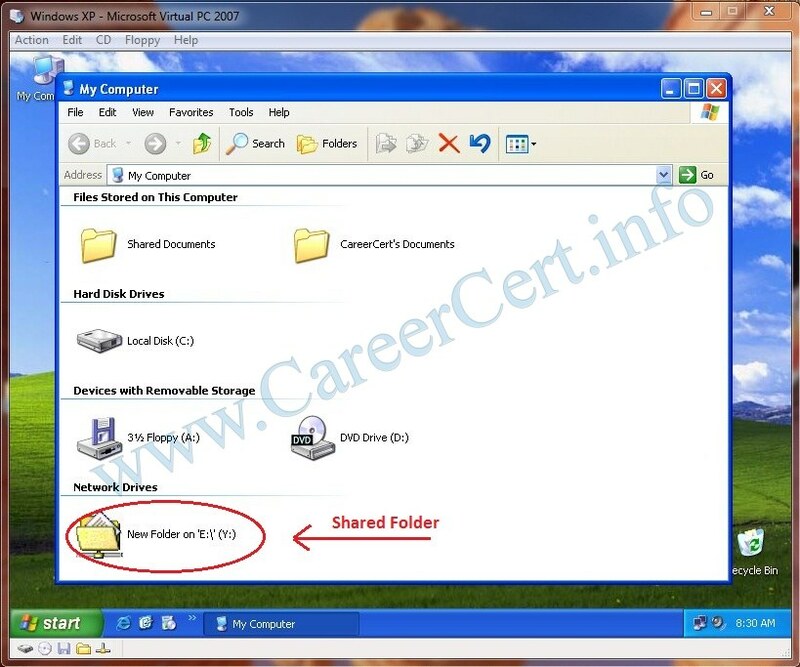 Put the CareerCert’s Pass4sure setups and other softwares in that share folder and access them in Virtual XP. 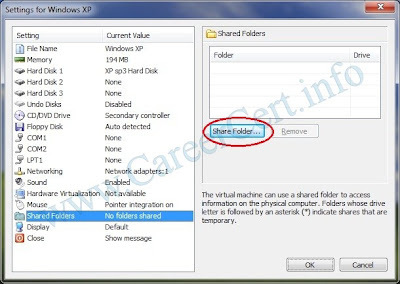 You can see in below image that the shared folder is showing under “Network Drives” in virtual XP console. BTW you can also drag and drop files and folders from Host to Virtual PC console. 17. 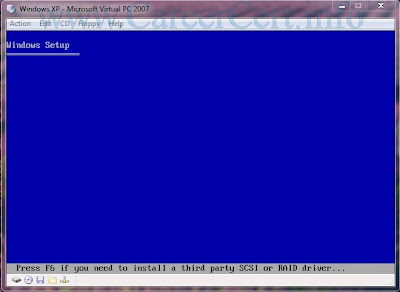 Run and install P4S Setup from shared folder and and let it restart the virtual XP console after installation. 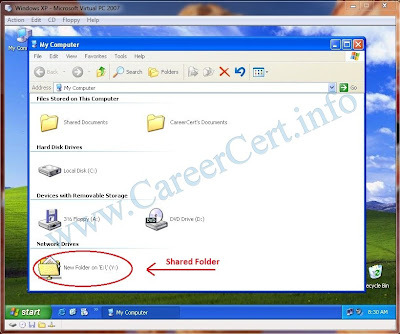 You can start the pass4sure application from desktop shortcut. 18. To close the Virtual XP, go to Action – Close and chose “Save State“. You can also chose “Turn Off” but it will take more time to boot again. 19. 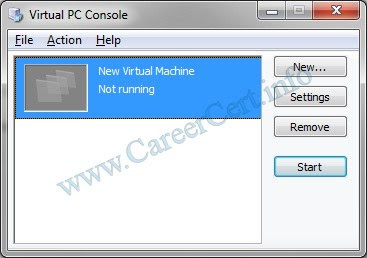 To open your Virtual XP once again, select the Virtual XP from the ‘Virtual PC Console’ and click “Start”. 20. You are done!! Enjoy!!! 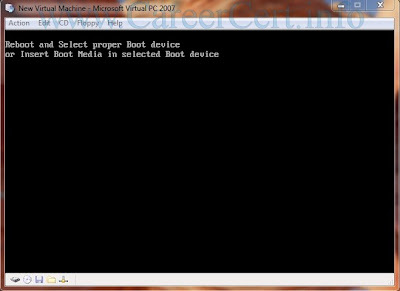 for better used virtual box 4.0 …..
plz tell me the old way to install P4S, that is by changing something through command prompt. i did it 5 months b4, but now dont remember how to change that thing through command prompt. your qiuck reply will help me a lot. Any link for NETSIM 8.0 for CCNP with its activation key ? Does any one know where to get this career cert pass 4 sure application? This method only applies to old versions of pass4sure. Crap , I can’t make it on vmware workstation. It installs ok and volume ID does not work . You can download VMPlayer as an alternative to VirtualPC. I used VMPlayer for my checkpoint studies and it works great. Win7 home edition doesn't support virtual PC. You need a higher edition of windows. Thanks for the advice. I have gotten it fixed. Thanks a bunch! I think you have a older version of XP. 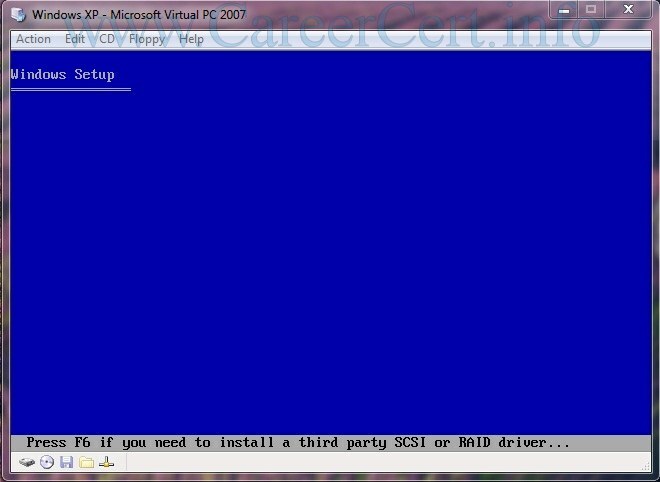 I have just installed the Virtual PC on Windows 7 and also installed the P4S BSCI 6.85 Full Setup on the Virtual XP. My problem is the P4S prompted me for serial number and i did not see DCOM service in terminal services list on the Virtual XP machine. 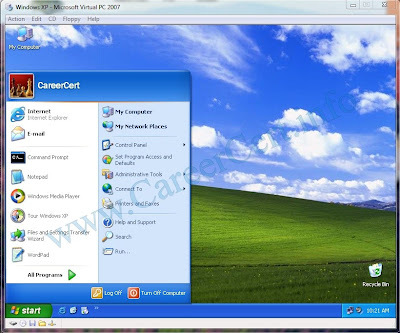 While downloading (•CCNA 640-802 Latest Pass4sure v3.00 – 609 Questions)….on my machine with Vista OS service pack1 it is asking me password for the zip download to open.Can any1 help me with the password ASAP. Did you install "virtual Machine Additions" ?? You can't create a shared folder unless you install this. BTW network sharing is also a good option. You can also drag and drop files and folders between host and virtual pc. Anyways thanks a lot for your help in sharing this dude..
P4S is blocking internet ?? Never heard about this. If p4s is installed in virtual machine then it'll not affect the host OS. Just enable DCOM server service from control panel in the host OS. So if I install ps4 on virtual machine, it will now effect my actual system, I still can browse the internet? When ps4 is installed it does'nt allow me to access the internet……………. yep..vmware is better than MS VPC in my opinion. I have installed Vmware player 3.0 and xp is installed on my machine……. 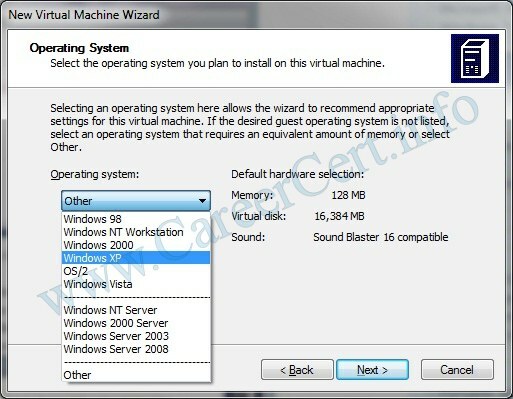 Virtual PC does not install on vist service pack 2 and is only supported on vista service pack 1. So you want to say that MS virtual PC is not running on vista home premium sp2 ?? 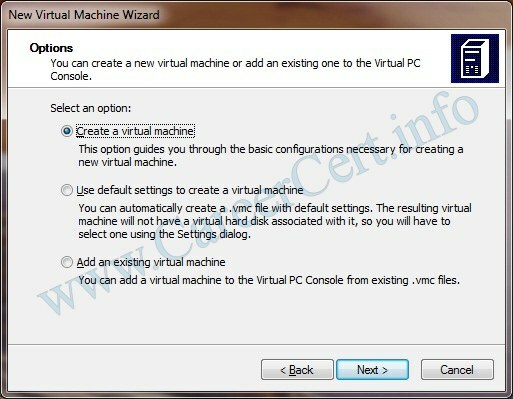 Is there any othre way I can install virtual machine? It should work. Give it a try. i have windows xp media center edtion CD from my old computer with key will this work when installing virtual machine on my crappy vista???? Is there any new version of ps4 640-802…. have exam in 3rd week january. before that u install bit torrent in ur system. i.dont have windows xp cd or iso image. Where can i get a download of the iso image. Please help!!!!! !